Soup Comforts, Warms Up a Brutal Winter! Home » Soups, Salads & Sides » Soup Comforts, Warms Up a Brutal Winter! I have a love, yet hate relationship with winter. I love how picturesque and pristine everything looks after a fresh snowfall. And consequently my dogs love romping around in the backyard through the drifts of snow. But when the wind chill goes below zero, that’s when my love for the beauty of winter turns to annoyance for the reality of just how cold it can be. The extended periods of cold, dry air saps my energy. Most of all, winter can make me a bit grumpy. 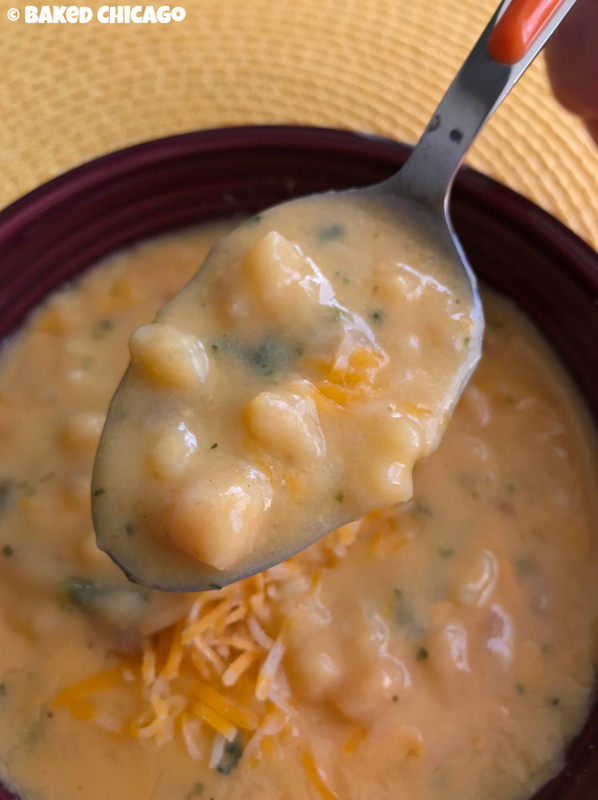 But one of the ways that I like to warm up my winter — and it’s been brutally cold so far — is with soup, soup, and more glorious soup! Whatever powers that be which named January as National Soup Month picked the perfect time to celebrate how comforting, nourishing, and totally satisfying a hot bowl of soup can be. When I’m preparing soup, I look first for flavor and then for convenience. 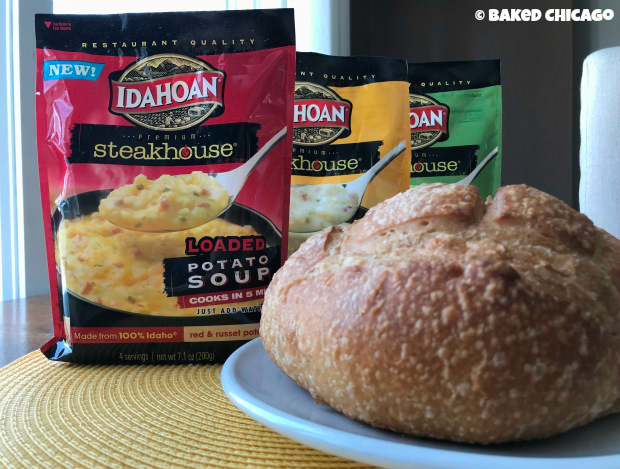 Idahoan Steakhouse Soups bring together real, red Idaho® potatoes with flavorful seasonings and rich cheeses to provide a creamy taste in every spoonful. First of all, I boiled four cups of water. 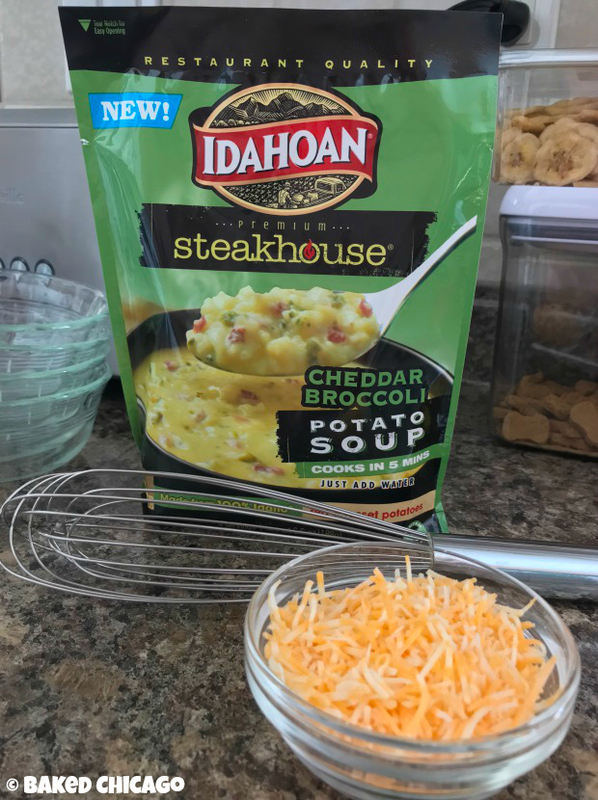 Then I whisked in the Idahoan Steakhouse Soups Cheddar Broccoli flavor. So simple! 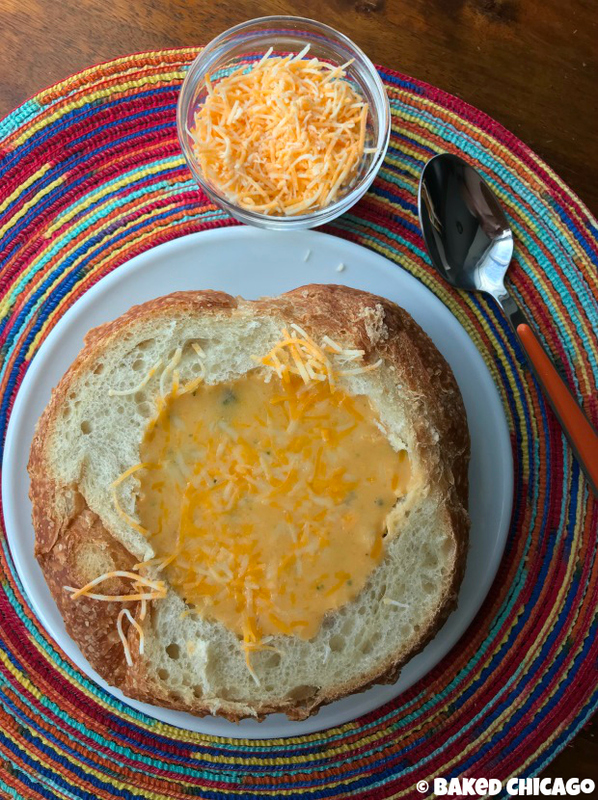 For the first soup I tried, I decided to make a sourdough bread bowl — which is much easier than you might think. So I took a whole loaf of sourdough bread from my local bakery. I cut off the top third of the loaf. Then I hollowed out a bowl. Finally I garnished it with some shredded Cheddar cheese. 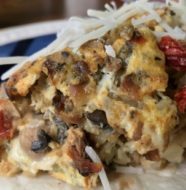 I was really impressed with the texture, because it had a variety of sizes of potato chunks. 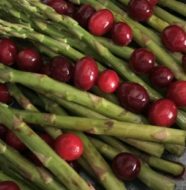 As a result, it made for a delicious balance of textures. 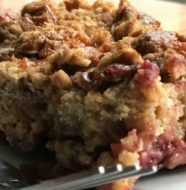 It was almost like having little potato dumplings in a thick, creamy potage. Hence, my taste buds were very happy!